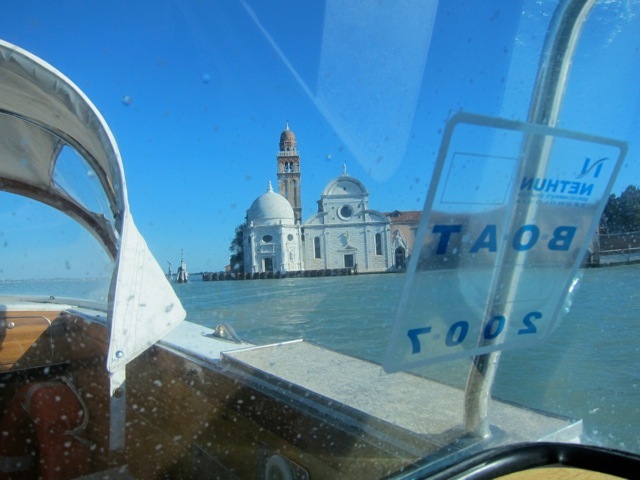 As we approached the city by water taxi, it was sparkling under the bright sun. This was my first trip to this magical city; although I had planned to go several times over the years, something always got in the way and my plans were put on hold. This time I was determined to explore this city that had already been a distant source of inspiration. Through books, paintings, photographs and movies I had formed what I thought was a clear vision of this floating city with its gondolas and rose-colored sunsets. But, nothing had prepared me for the unique beauty that enveloped me each day as I walked this maze of streets and bridges that have remained without change for centuries. Approaching the historic Hotel Danieli for our first stay in Venice. My ability to observe has become an essential tool in finding inspiration for my interiors and furniture designs. Due to a relentless work schedule, I have learned to be fast in capturing moments or images that I can use for inspiration. Clients and friends have often commented on my silence as we walk streets lined with antique shops and galleries. Even my partner of 27 years gets a little frustrated by my silence in hopes that I will express my thoughts as we explore city streets searching for new discoveries. It’s not that I don’t like to talk — I’m just taking in everything in hopes of discovery. It could be finding a piece of furniture to jump start a project, spotting an architectural detail that inspires a new cabinet idea, or admiring a piece of jewelry that launches a mirror design. I thought it would be revealing to share some of my photos, and perhaps in doing so, I will share my way of finding inspiration. 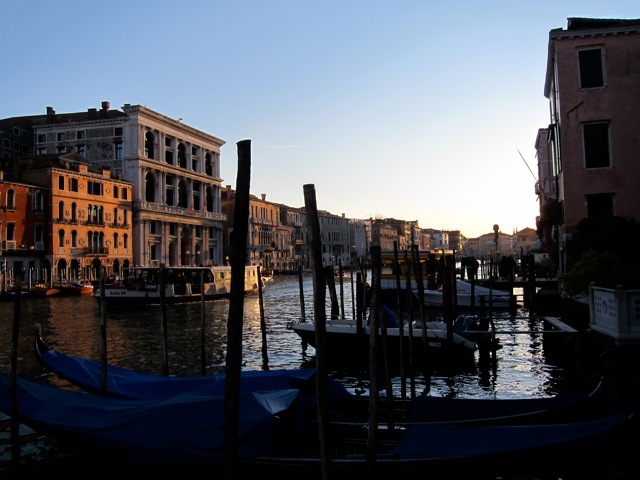 Every day began with a fabulous breakfast in our room overlooking the waters of the Bacino San Marco. We left the room each morning without a predetermined list of places to see. We just walked and took it all in. 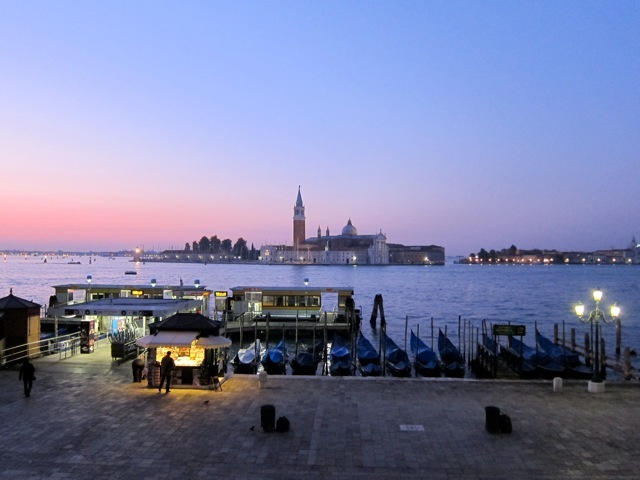 An amazing sunrise view of the Church of San Giorgio Maggiore from the window of our room at the Danieli. The view was so postcard perfect, it was like waking up on a movie set each morning. First, let me say that all those paintings of Venice depicting emerald water running through glistening streets illuminated by Disney-like sunsets are true. Every day I was stunned by the color and the light. We were also very fortunate to have experienced beautiful sun-filled October days without the burden of summer heat and summer crowds. The light seems to propel this gondola through the canal. With all the grand architecture and big visual moments you discover as you walk the streets of Venice, I was captured by the smaller moments: the simplicity of a weathered door set inside a classically detailed façade, striking color combinations and patinas that only time can create, the simplicity and elegance of a small window that without any decoration straddles the entrance to a grand palazzo. ...and another. Both a study of simplicity. 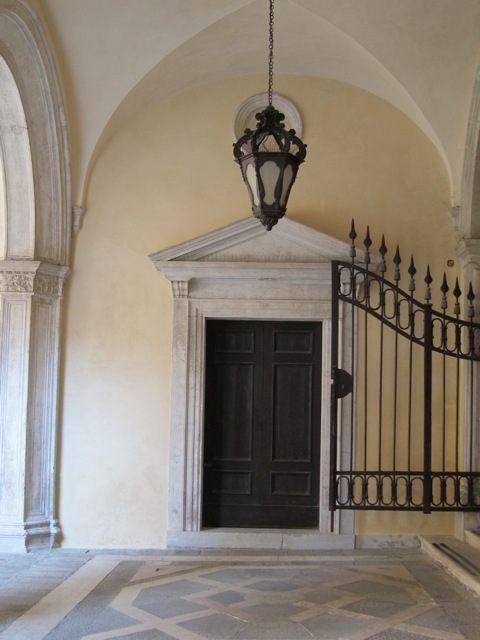 Loggias with columns repeating under arched openings, vaulted ceilings, bold flooring patterns, stucco walls in sun bleached colors set against carved marble details were calling to me like the bells of the Campanile in the Piazza San Marco. 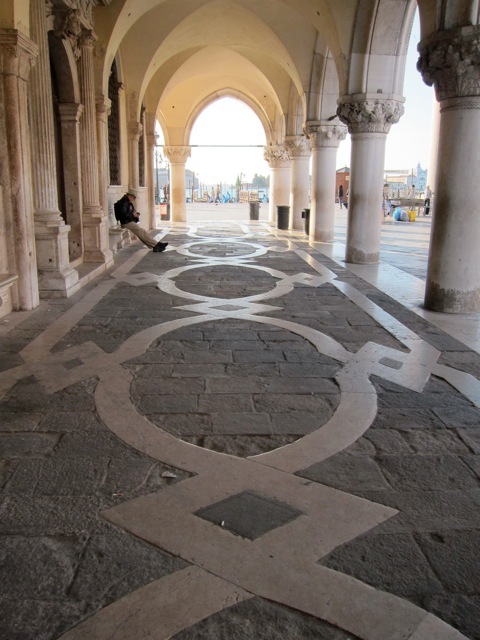 Beautiful arched passages with bold floor patterns line the perimeter of the Doge's Palace. 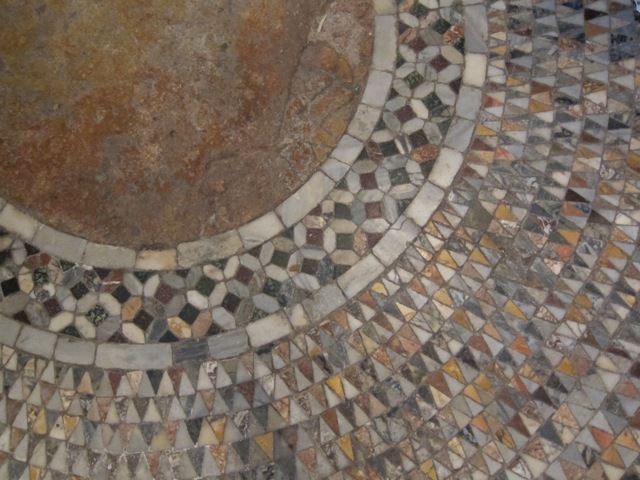 Radiant mosaics patterns decorate the floor of the Basilica San Marco. 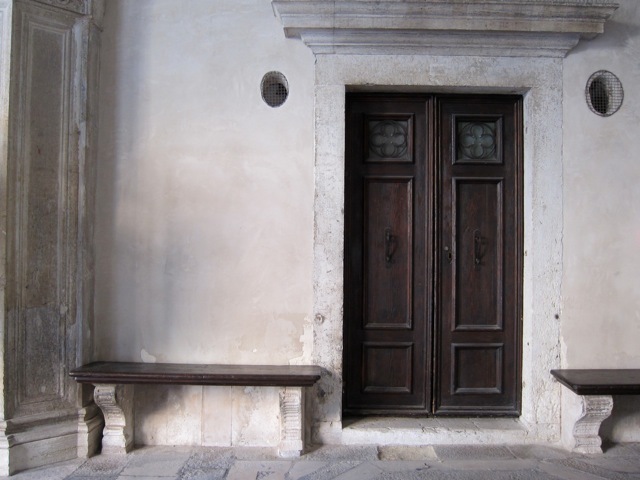 I was taken by the texture and color of walls and doors that only time can create. 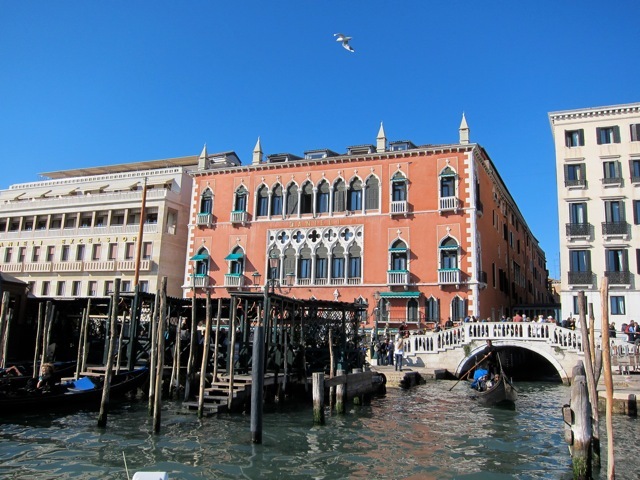 The Palazzos that line the canals show a history of architecture that spreads through centuries. A fusion of the Byzantine world, the Gothic, the Classical Renaissance and the Italian Baroque create a uniquely unmistakable cityscape. Every evening a sunset lingered over the city like the glow from a giant lantern. 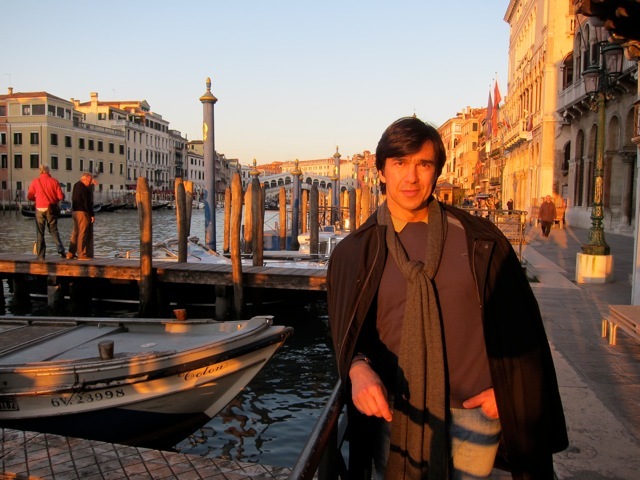 Juan Carlos takes in a moment of the Venetian light. 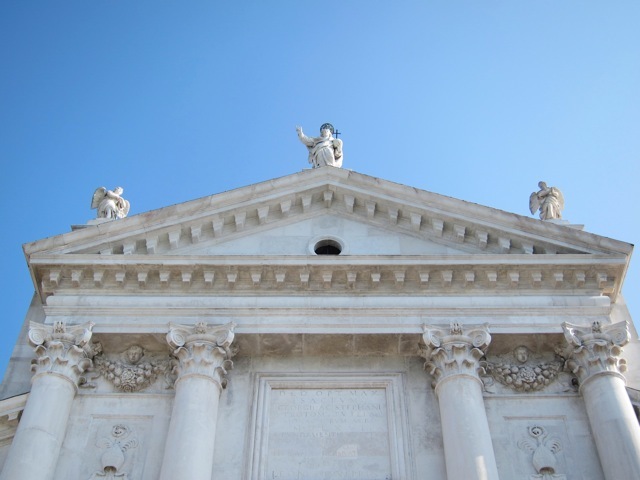 Andrea Palladio’s beautiful Church of San Giorgio Maggiore is a serene retreat. This church turns out to be one of the final projects of a master architect whose talent for combining simplicity, grace and strength is worth study and reflection. Inside this church the subtle color combinations of stone and plaster have taken on a platinum hue that I hope to capture in a future project. 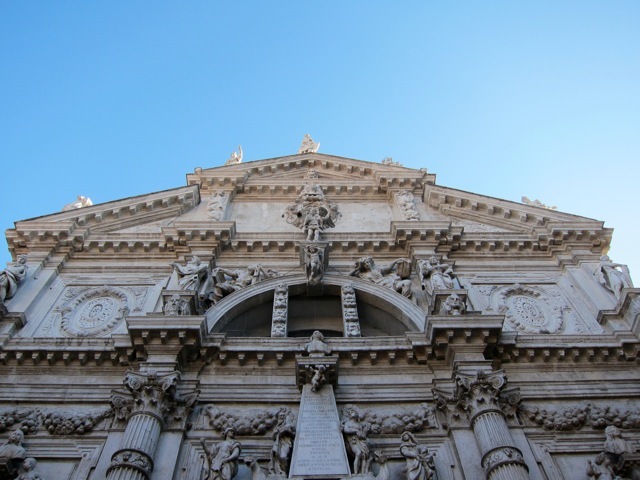 The brilliant exterior façade of the Church of San Giorgio Maggiore. 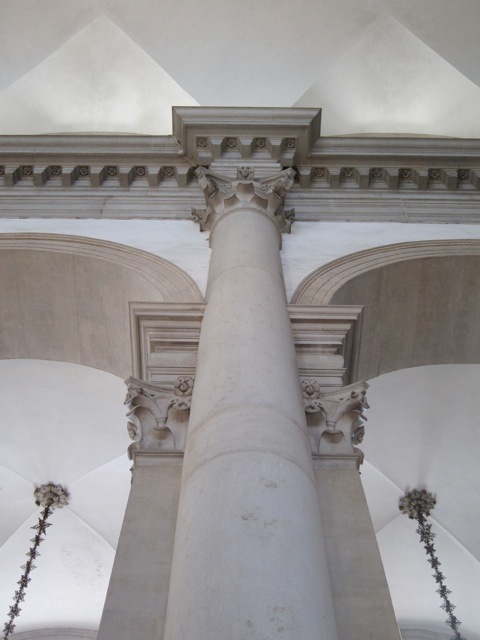 Interior detail from inside San Giorgio Maggiore. Unadorned by colorful decoration the simplicity of its neutral tones of platinum and ivory bring focus to the strength of the architecture. 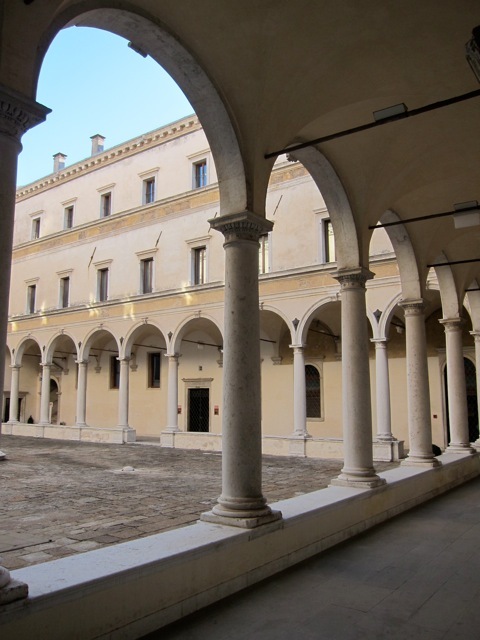 Colonnades provide a strong architectural signature throughout Venice. Churches rise with imposing force even along the most humble of streets. 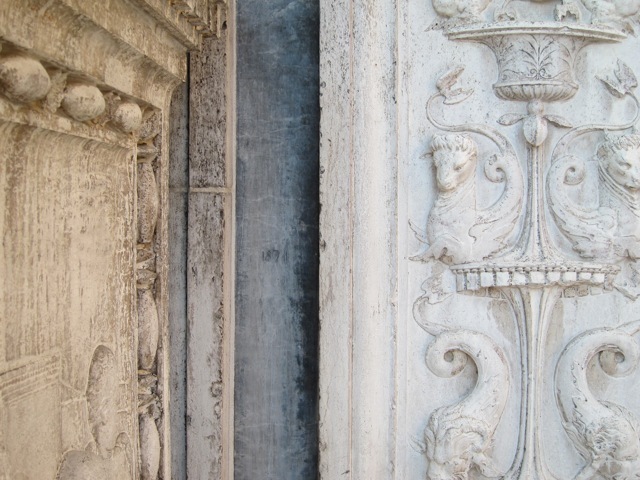 After four inspiring days in this beautiful city, arched colonnades, rich patinas and shimmering light pushing my creative buttons, I headed back to our apartment in Paris to finish the designs for my new Baker collection being introduced this coming Spring 2012. 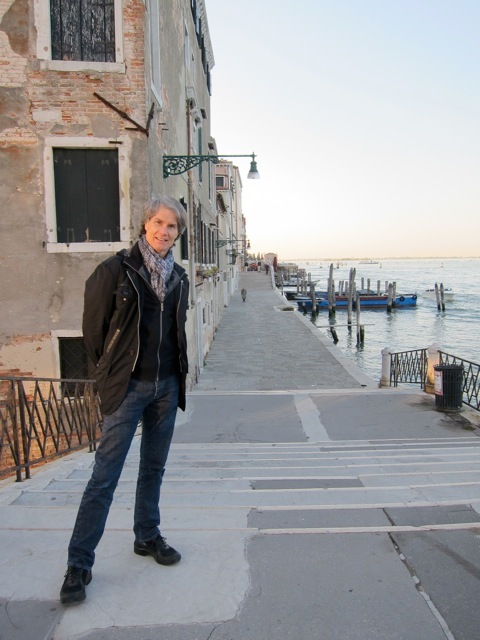 Now a few weeks later, back in my Washington studio, as I take a final look at my designs, I am excited to realize those beautiful four days in Venice have subtly worked their way into my new collection. 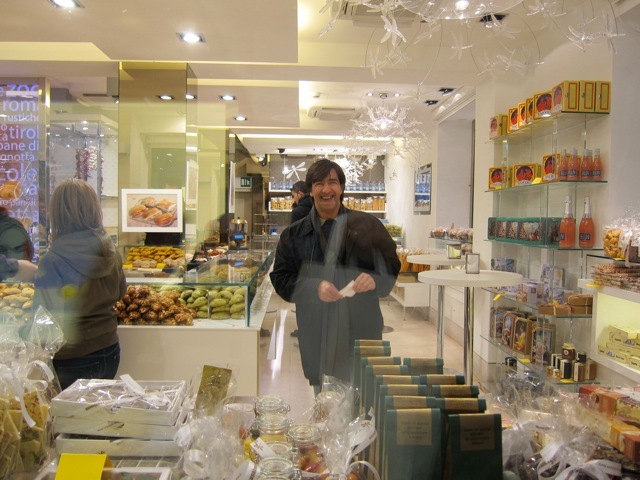 The world offers us all so much inspiration, all you have to do is go, walk, observe with an open mind — and stop every now and then for a biscotti! This entry was posted in Baker Designers and tagged Design inspiration, The Thomas Pheasant Collection, Thomas Pheasant, Travel. Bookmark the permalink. As a long-time fan of his work, I am equally a fan of the accounts of his travels. Like a master-storyteller, Tom crafts a tale that is poetic in its appreciation for the color and subtle texture of the world around him. His narratives excite the imagination and inspire us to slow down and observe; beauty is everywhere, both near and far from home. Great post! 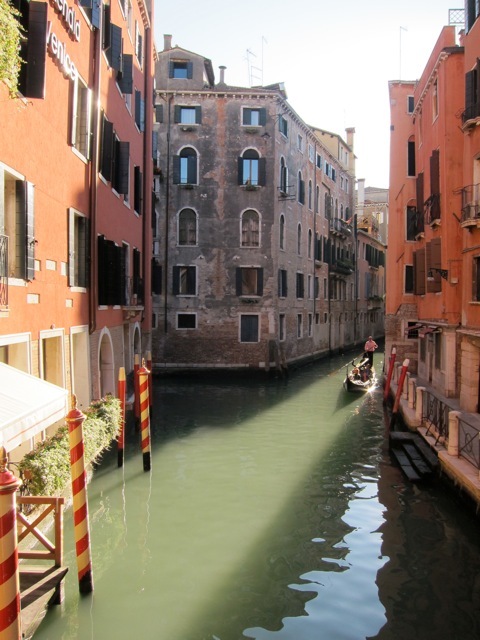 Hi Christine – Glad you enjoyed Tom’s account of Venice! We will have more posts like these in the coming months – make sure to subscribe to our blog to receive an email when we post something new. de toutes les nuances de marbre blanc du matin et de toutes les lumières dorées des fins de journée de la Sérénissime. What *took* you so long? And only four days? We should talk.